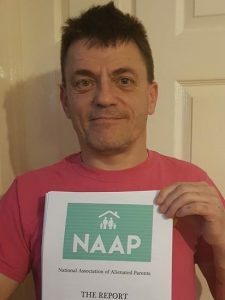 A leading campaigner against parental alienation has called for a ‘ban’ on yellow safety vests on his peaceful country-wide protests because of international thugs. Andrew John Teague, from Swansea, who has more than 100,000 followers in his battle to get parental alienation made a crime, climbs mountains and walks marathon distances to get his point home. As his gruelling battle continues, Andrew revealed that on Christmas Day he had taken 10 million steps in the right direction. The biggest day in the family calendar brought the first leg of his never-ending walk to a dramatic end as he and other members of D.A.D.S (dads against double standards) scale the 2,000 feet high Pen y Fan in South Wales. But on every walk or climb they have worn yellow vests for safety. 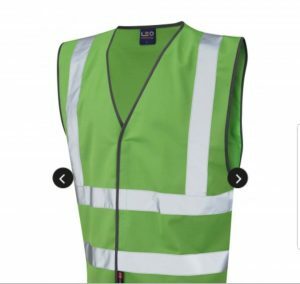 Today, however, Andrew said: “This is the reason we have ditched the yellow vests which symbolised safety on my walks, especially late in the evenings. “The reason is the thugs who wish to run with the crowds. It actually makes me wonder, when there are so many parents fighting for their children – if they thought of acting like these hooligans – they would have it used against them in family courts. “These lefties or righties, ins or outs, act like animals for glory. “You know I feel so very sorry for parents who are bullied and tortured, left broken and terrorised with their kids stuck in the middle – but these are true people who fight against a broken system that strikes at them all the time. Now members of D.A.D.S (dads against double standards), NAAP and other groups across the world are being asked to wear green vests. 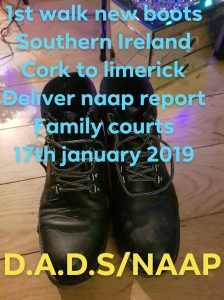 Andrew is currently in Cork delivering copies of the NAAP reports to court houses. Security officials and retailers said industrial safety equipment dealers have been instructed not to sell yellow vests to walk-in buyers and to restrict business to wholesale to verified companies, but only after getting police permission.